FCSI The Americas, the only consulting society dedicated to serving independent foodservice design and hospitality management professionals, debuts a new show,&nbsp;BUILT., and expert insight center on Foodable Network. “Partnering with Foodable Network to create this content channel is an exciting new marketing initiative for FCSI The Americas,” said Wade Koehler, Executive Director of the FCSI The Americas. 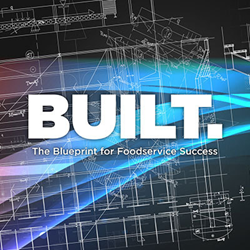 FCSI The Americas, the only consulting society dedicated to serving independent foodservice design and hospitality management professionals, debuts a new show, BUILT., and expert insight center on Foodable Network. This new show explores the innovative process of various projects, ranging from stadium designs and rethinking restaurant brands to foodservice at hospitals and educational institutions. These projects, led by passionate FCSI The Americas consultants, uncover everyday foodservice challenges and inspire viewers to discover solutions of their own. BUILT. is distributed on Foodable Network with secondary distribution on iTunes and other platforms. "Foodable Network is proud to be leading a new era in trade media creating a whole new genre of content for the professional restaurateur and operator, BUILT. is just one of our first steps for the network with plans for dozens of WebTV shows that propel our industry," said Paul Barron, Founder and CEO of Foodable Network. Additionally, FCSI The Americas is the proud primary sponsor and main contributor to the Foodservice Pro Insights on Foodable Network, featuring blogs from our own expert members to share thought-provoking and purposeful knowledge with the industry. Established in 2008 as the Americas Division of FCSI, the association represents independent foodservice consultants throughout North and South America. Today, it remains the largest of three divisions that represent the Foodservice Consultants Society International.